Raising Ella Lynn: Sometimes, I say the wrong thing.. Going through a life changing event like having a baby born with special needs changes you. It makes you a little more cautious to tell people "don't worry, I'm sure it's nothing". I talked with a friend who is having a baby. Their ultrasound showed a soft marker for perhaps a genetic condition. 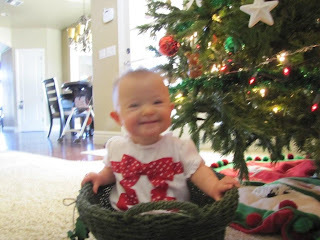 As he was telling me, I couldn't help but think back to my own ultrasound and being told "don't worry, we know you have a marker for Down syndrome, but everything looks totally fine". I remember people telling us not to worry, everything was going to be fine, she was going to be perfect and healthy. I remember searching google for anything I could find on Echogenic Foci and being so reassured that it was so often nothing. I remember the paper the dr. gave me explaining what an EF was and how it talked about Down syndrome and how I ignored it because well, everyone said it was going to be ok. I am thankful for those people who told me it was all going to be OK. 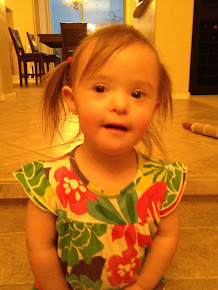 I am thankful for my own blissfull ignorance to what it could be, I am thankful (well, almost) for the Dr. telling us that Ella didn't have Down syndrome. Why? Because for 98% of the pregnant population, it is going to be OK and there is no reason to spend a pregnancy worrying about the off chance that we are the 2% The minute after our level 2 US was complete, I didn't worry about Down syndrome again until 8:30 AM on February 16th. Today, when talking with my friend, I wasn't one of those "don't worry, it is nothing" people. I was exactly the opposite of what I was thankful for during my own pregnancy. I said what came to my mind. I told him that even if it is something, it doesn't matter, you will still love that baby like every other baby. I said that it is good that he has 2 other kids so he doesn't have the "new" parent jitters. I told him that I wouldn't change my life now for anything. I told him that everyone told me it was "nothing" and well, it was "something". After I hung up I felt awful. This poor guy. Calls to tell me about work, mentions he has a baby on the way and had a not so "perfect" ultrasound and I can't just say something like "don't worry, it happens all the time, your baby will be fine". I have to break out my own story, my own "don't worry" predictions. I probably sent him worrying for the next 2 hours and well, for most, it is going to be OK, there isn't anything to worry about. Our story isn't the norm, but when I talk to people, I forget that. I am so passionate about how yes, the initial shock was hard, but you will survive, you will grow stronger than you ever thought. I can't help but be the other side of the coin, not for the negativity, but for people to realize that the other side of the coin isn't such a bad thing. What a doll and love her big smiley grin! To be honest, I think what you said was perfect. When I was pregnant with Russell I had three ultrasounds, the first two were perfect the last one showed the kidney measuring at a higher end of the "normal" range. My Dr. and everyone around me told me it was nothing, dont worry about it, everything was fine...But I knew. I just knew something was wrong. Sometimes parents have a gut feeling they cant ignore, and its nice to have people tell you its going to be ok...But to have ONE friend that acknowledges your fears and tells you that even if something is wrong it will still be alright and you will love the baby no matter what...Thats a good friend! I totally agree with Jenny. I think your response was full of love and support. The others who say, "it's going to be ok" are doing the best they can, but you have given him the answer that will make everything better no.matter.what.